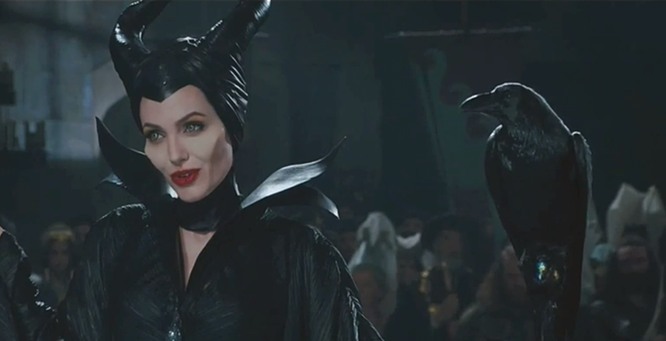 When I saw the preview for Maleficent, I felt akin to Angelina Jolie. She plays the snotty bad fairy in a new Disney movie of “Sleeping Beauty.” Only I look a lot more like the fairy-tale hag, as I tell my husband. He doesn’t know the story. I will explain shortly why I am like the snotty evil fairy. But here’s why I am Maleficent. On the Monday after my arrival, I discovered I had not been invited to a Virago group meet-up in London. “I feel like the evil fairy,” I wailed to my husb. He didn’t know what a Virago group was. Some months ago, I joined the Virago group at LibraryThing. I have perhaps visited it five times. I have perhaps posted twice. The group had had a big blow-out party at Foyles for another American Virago fan who was in London at the exact same time I was. Well, they met at Foyles anyway. And then they went to Oxfam, the London Review of Books shop, etc. I wondered, Was I not absolutely clear about the fact that I was coming to London? I blogged about it so often. Well, it’s water over the dam. I went to LibraryThing recently and discovered a folder about the London trip, so presumably I would have been allowed to attend had I known about the event. Over the years I’ve met so many kind American friends from online groups, and I spent a very pleasant couple of days with the lovely Ellen Moody in D.C. last fall. I’m happy to have coffee with any of my online friends next time you’re in town. I’m only Maleficent in London. This entry was tagged Maleficent. Bookmark the permalink. When you next come to the East Coast, please plan to have coffee with me. I can make it myself or take you to Starbucks. I was in Iowa once, on the way to Montana, but I think my traveling days are over. Nancy, I’d love to have coffee with you! I don’t travel much either, but you never know. And you’re always welcome here if you ever do come to Iowa. I’m obviously having comments issues here, because I’ve tried to leave this twice – here goes again!! You certainly aren’t Maleficent! I don’t think you ever said exactly when you were going to London and if I’d known you were going to be around the same time as the meet up I certainly would have encouraged you along – it’s not a case of *invites*, more of adding yourself in on LT – all were welcome! If you’re in London again, shout out there – you’ll find many people keen to meet up with you and bookshop!!! Karen, you’re always so kind. I checked the LT board so seldom that I wasn’t aware of the get-together. It was right there in the open, I saw, when I finally took a look. Yes, next time we’ll get together. Your comment ended up in spam! I unspammed you, so I hope this won’t happen again.